If you’re a regular reader of my blog you know that I’m on what seems like a neverending quest to figure out who the Dolan’s in Patrick Dolan’s reinstated probate file were. The quest has sent me in circles like a crazed character in a Looney Tunes cartoon. Patrick Dolan died in 1905. But, his probate was not settled before the 1906 earthquake and fire in San Francisco. The probate proceedings were refiled by his niece, Mary (Kelly) Meincke. When the probate was reinstated, the California and Massachusetts cousins fought over who was Patrick’s true heir. The probate file is a gold mine of information. While it is a great source of information, it leaves many unanswered question. One of them is why William and Thomas Dolan mentioned in Patrick Dolan’s obituary were left out of the proceedings. Who Were William and Michael Dolan? I have no clue. If you know, please tell me! All I know is their names are in Patrick Dolan’s obituary and they were alive in 1905. I have no proof that there was another Dolan family in San Francisco. For all I know William and Michael never left Ireland. I’m making the assumption that because they were named in the obituary and the Boston cousins were not, that Patrick’s niece had contact with them. And, I have to start somewhere, right? This is a wonderful pictorial history of the Irish in San Francisco. Maybe I’ll find William and Michael hiding in these photos. Father was born in Co. Roscommon, Ireland. Parents may have been in Massachusetts first, then came to San Francisco. Father died before Patrick Dolan in 1905. Dolan family must have two sons Michael and William presumably of the same age as their cousins by 1900. 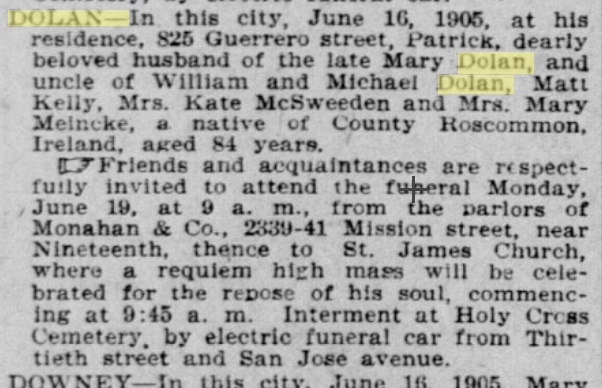 Only Michael and William are alive by 1905 when Patrick Dolan’s obituary is published. Sounds easy, doesn’t it? HA! Their are so many Dolans in San Francisco between 1860 and 1900 that I might as have been looking for every Irish family who came to the great city before the earthquake and fire. This Family or That Family? I narrowed down the possibilities to two families that fit my requirements. In I Found John Dolan’s Obituary, I summarized how I eliminated one family when I found the patriarch’s obituary. John Dolan was from the wrong county in Ireland. It was the wrong family. Michael Dolan was my next candidate and he looked more promising. To start with, he was born in the right place: Athlone, Co. Roscommon, Ireland. Michael married a woman named Honorah or Hannorah (aka Hannah). Michael and Honorah were in Cambridge, MA in the 1850s where they had two children: Michael and Elizabeth. Then, they headed out to San Francisco where they had three more: Thomas, William, and George. Michael Dolan, b. ca 1830, Athlone, Co. Roscommon, Ireland; d. 1890, San Francisco, CA. So far so good! We’ve got a Michael and we’ve got a William. The problem is I can’t establish when the children died. The only thing I can confirm is Thomas is alive in 1900 and recorded in the 1900 US Federal Census. His mother was living with him as well. It appears he may still be alive in 1910 if an entry in the city directory is him. Is this another dead end? Since I know that Mary (Kelly) Meincke did not name Patrick Dolan’s nieces and nephews who lived in Boston in his obituary, is it possible that she wasn’t all that clear on who her Dolan cousins were? In her grief, did she mix up names? If she made an error, then I might be on the right track. Then again, if Mary Meincke was confused, I could be looking for a Michael and William Dolan who never existed! I do know this. In Thomas Coyne’s Will Settles It, I show that the Boston cousins knew all about their uncle’s death. And, in conversations with a descendant of that line, I know that one of Patrick’s nephews made a trip out to San Francisco before Patrick died. The family has his diary to prove it. Why are the Irish So Difficult to Research? I’ll hold onto this family’s information. Maybe I’ll find the missing piece to prove or disprove the connection. Michael Dolan Sr. voted which means he became a citizen. It is possible there is a naturalization record that will have the answer I seek? Is it possibly I might locate mortuary records showing that Patrick Dolan paid for plots for this Dolan family as well as my Kelly’s? Will a DNA match hold the key to who William and Michael Dolan really are? I’m not holding out hope on that fairy godmother thingy. Do you have an impossible genealogy problem that you’re working on? Have you solved one? Tell us about it in the comments. I am trying to find information about my grandfather Patrick Dolan. I don’t believe he is the same one in San Francisco. My Grandmother was Ruth Louise Grau, she later changed it to Louise Grau. She married Patrick Dolan and they had a daughter Carol who is my mother. Patrick apparently died in a fire I believe in Chicago, Il around 1942 or 1943. My mother was born in 1937 and he died when she was 5. I know he died in a murphy bed while smoking, and I have been unable to find any information regarding this side of my family. I was just wondering if anyone has heard or found anything about Patrick Dolan? I know my grandmother resided on Beldon Avenue in Chicago and later moved to Cleveland. Any help would be appreciated! Laura, I don’t know your Dolans, but I’ve approved your comment. Maybe someone will see it and recognize their family.